Hi, teacher I hope when you read this story, you will like it. My name is Sonia Izaguirre. I've been living in San Francisco for 5 years. I live with my mother and brothers. There is a funny and true story about the apartment we live in. It was August 2008 when my body started to have some kind of allergy. I didn't know how I got it because I had never have an allergy in my life. Then, I went to the doctor to see what I had. He didn't know and he gave me some medicine. He made an appointment to see the specialist, a dermotologist, who could tell me what kind of allergy I had. Since that time, I have that problem all night. Finally, I went to see the specialist. What a surprise!!! 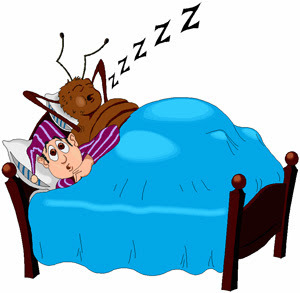 It wasn't an allergy in my body, it was the famous bedbug. The specialist explained to me where they are and how they came to the house. After I saw the doctor, I got home and I explained it to my mom, and you know, teacher, what she did? She threw out my bed. That night, I slept on the floor. She didn't wait for a different solution. So what could I do? She was upset. This story is true, and that's why we have to check everything over before we buy a new furniture.